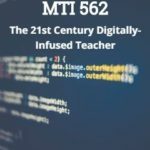 Through the Midwest Teachers Institute, I offer four college-credit classes that teach how to blend technology with traditional lesson plans. They include all the ebooks, videos, and other resources required so you don’t spend any more than what is required to register for the class. Once you’re signed up, you prepare weekly material, chat with classmates, respond to class Discussion Boards and quizzes, and participate in a weekly video meeting. Everything is online. Assessment is project-based so be prepared to be fully-involved and an eager risk-taker. Price includes course registration and all necessary materials. To enroll, click the link, search for MTI 558 and sign up. Classes start in May! The 21st Century lesson blends technology with teaching to build a collaborative, differentiated, and shared learning environment. In this course, teachers will use a suite of digital tools to make that possible while addressing overarching concepts like digital citizenship, internet search and research, authentic assessment, critical thinking, and immersive keyboarding. Teachers will actively collaborate, share knowledge, provide constructive feedback to classmates, and publish digitally. Classmates will become the core of the teacher’s ongoing Personal Learning Network. Assessment is project-based so participants should be prepared to be fully-involved and eager risk-takers. Assessment is based on involvement, interaction with classmates, and completion of projects, so be prepared to be fully-involved and an eager risk-taker. Price includes course registration, college credit, and all necessary materials. To enroll, click the link, search for MTI 562, and sign up. Classes start in May! Differentiation in the classroom means meeting students where they are most capable of learning. It is not an extra layer of work, rather a habit of mind for both teacher and student. Learn granular approaches to infusing differentiation into all of your lesson plans, whether Common Core or other standards, with this hands-on, interactive class. Ideas include visual, audio, podcasts, movies, mindmaps, infographics, graphic organizers, charts and tables, screenshots, screencasts, images, games and simulations, webtools, and hybrid assessments. Assessment is based on involvement, interaction with classmates, and completion of projects, so be prepared to be fully-involved and an eager risk-taker. Price includes course registration, college credit, and all necessary materials.